Back in March the LG Revolution made its way through the FCC and although the word was the LG Revolution is expected to release on the Verizon network as of today the 12th of May, as we reported previously (here), it appears that release date will be delayed. 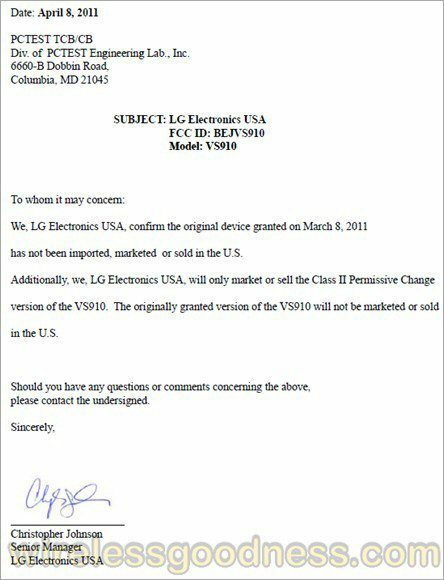 The reason for this possible delay to the release of the LG Revolution is Wireless Goodness is reporting that a class-II permissive change notice for the LG Revolution has now show up on the FCC, and apparently a letter accompanying the change notice confirms that the original version of the LG Revolution will not be releasing in the United States. Apparently a revised version of the LG Revolution that was passed by the FCC yesterday will be the model destined for the US although currently it isn’t clear what the differences are as both handsets carry FCC approval for WiFi, Bluetooth, 4G LTE and CDMA/EVDO 850/1900 bands. Thus it would appear that anyone expecting the LG Revolution to become available on Verizon today will be somewhat disappointed, and can only hope that the Android device will make an appearance sometime soon. Yet another BS delay from Verizon. Want a phone with android 2.3 gingerbread? Yea not going to happen on Verizon, america's slowest moving network. For months they say that the Droid 2 and Droid X owners Gingerbread, they say they will have 4G coverage, when they are lagging behind Sprint AND T-mobile for 4G coverage. FFS T-mobile has more LTE coverage in many places then Verizon…the nations smallest cellular company has more advanced and larger 4G LTE coverage then the nations largest….yea that makes sence. This is yet another reason the FCC should stop the merger from T-mobile and AT&T. Lets not make another giant cell phone company that moves at the speed of a snail on downers. Verizon NEVER issues release dates so how can you call this a delay? You are listening to RUMORS then getting mad at Verizon when the RUMOR doesn't pan out. I agree. And I hate when people complain what phones do or don't have. Like the LG Revolution has the Bing search instead of Google, they complain about it. And they complain because it doesn't have dual core processing, that to me is childish then don't get the phone. Dual Core processors would use up more battery power anyhow and you'd be charging your phone more often than not.